Introducing TradeScript, our powerful new programming language which allows traders to design trading system without prior programming experience. TradeScript allows traders develop trading systems quickly and effortlessly. its as easy as 1-2-3. With TradeScript, you can enable your trading application to run scripts which provide alerts when the price of a security reaches a new high, crosses over a moving average, or drops a set percentage, through those are only a few examples. TradeScript can also scan the market, generate trade signals, back-test trading strategies, and much more. Create automated order entry script. Run Thousands of simultaneous alerts. 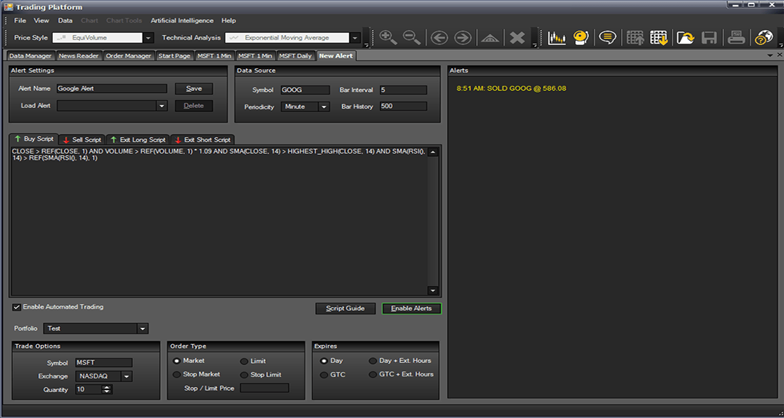 Create back tests and trading system optimizations. Bulid script-driven chats and expert advisors. Get formula outputs in real-time. TradeScript was originally designed as a high-performance programming language for high-frequency trades. It was designed to scan over 10000 stocks based on complex technical criteria and return instantaneous results-in under five milli-seconds. That was over ten years ago. Today it is even faster.